The popular infographic that we posted on Facebook about Jasper's frequent M3 crossings. Jasper has gained a bit of attention on the project. He was our only individual to regularly cross the M3, and his crossing was even highlighted on talk radio in Cape Town. His pictures and story were also featured in a recent Sunday Times article, and we posted an infographic about his crossings on the project Facebook page, which was very popular and viewed by thousands of people. In line with my predictions, on July 14, 2015, at 11:30am, Jasper was hit by a car on the M3 near Newlands Forest. He was hit on the southbound lane, trying to cross from the fragmented habitat east of the freeway to travel back towards Table Mountain National Park (TMNP). The driver reported that Jasper suddenly tried to quickly cross the highly trafficked road, taking him (the driver) completely by surprise– the accident was unavoidable. As a biologist that has spent years studying threats to survivals of charismatic wild cats (bobcats and mountain lions) in urban Los Angeles, I thought I would share how we handle project “logistics” surrounding the death of our study animals, the significance of the event for the project, and then some of the “positives” as I see them. Me carrying Jasper at the time of his capture to a shady spot where we were going to fit him with a radio-collar. Given that he was a small, young male, I predicted then that he would soon be hit by a car. Five different people reported jasper’s death, including the person who hit Jasper, called me to report the death, and 3 called within 15 minutes of the incident. This quick action by the community afforded us the opportunity to immediately go into action to recover the body, and document the location and circumstances of Jasper's death. So when we hear of a road kill, our policy is to drop everything and rush to the scene to gather as much information as possible. Often, we have observed that road kill can disappear within a matter of minutes by someone picking it up (for a variety of unknown reasons). So this is another reason that we mobilize quickly. Urban Caracal Project interns were luckily able to arrive within 30 minutes of the incident to recover the body and the radio-collar. A map showing where we recovered Jasper's body and where he was hit by the car. Jasper was up against quite a formidable path in trying to cross the M3 here with thick and fast traffic and no easy clear path to the other side. Our next critical step was to assess the “damage” and collect samples that can be used to understand if there were any factors that increased Jasper’s vulnerability to being hit by a car (i.e., rat poison exposure or disease). We performed a necropsy (the animal version of an autopsy) to collect samples from major organs and blood samples. We also took body measurements to assess his body condition and whether, as a young male, he rapidly grew in the last 3 months. We also collected his teeth so that we may be able to send them to a lab for “exact” aging because we are unable to do that based on tooth wear alone. We will use the blood and liver samples for disease and pesticide exposure testing. Our findings were that he sustained major fractures to his head and hindquarters, suggesting that his death was immediate and that he did not suffer as a result of the incident. Pesticide and disease testing take months once samples are sent to a lab, but there was no evidence of abnormalities that we could observe led us to believe that exposure to either contributed to his death. 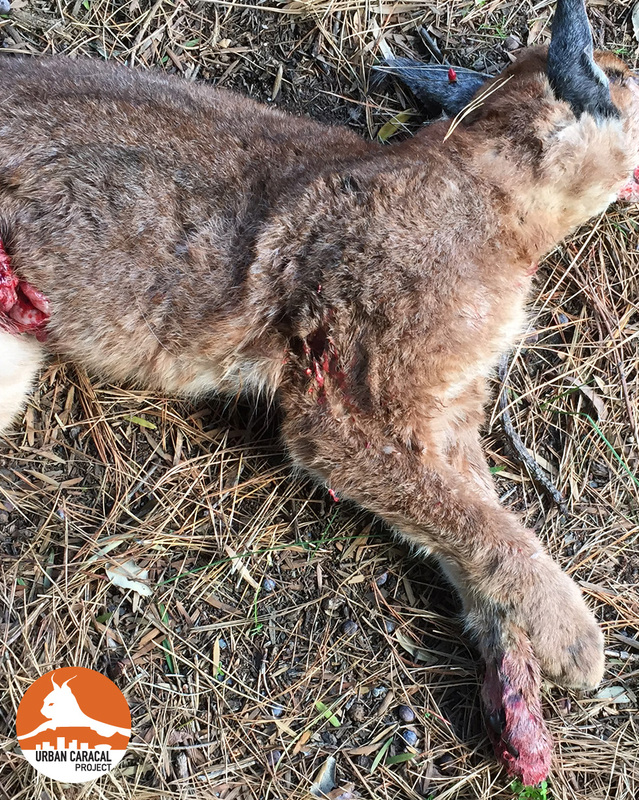 However, during my bobcat study in California, I found evidence that recent, yet low level, exposure to rat poisons may increase bobcat likelihood of being hit by cars, and the same may be true for Cape Town caracals. So what do I think was the main factor that led to his death, and frequency of crossing the M3? In my work on other projects examining the effects of urbanization on wild cats in California, USA, colleagues and myself have observed that especially young mountain lions of dispersal age but hemmed in by freeways are the most frequent individuals to be hit by cars. The animals that survive the longest in the Los Angeles area are the ones that use culverts and crossings that go under roads, thus reducing their probability of vehicle collision. Looking at Jasper’s movements over the past months, I’ve been skeptical that he was only using culverts to cross the M3, although I did visit one near Rhodes Memorial where I observed caracal tracks nearby, an indicator that the culvert possibly is used as a crossing point (we have placed a camera nearby to try to document potential crossings). But the frequency of Jasper’s crossings did suggest that he was at great risk for being hit by a car and his movement patterns suggested that he might not have always been using the culverts. So why was he crossing the M3 so much? The most likely reason is that, as a young male at dispersal age, he was trying to find a new unoccupied territory, but the areas east of the M3 offer little habitat for caracals. So in regularly crossing, he seemed to be “exploring” different areas that could offer space for him. We have also documented at least 3 other adult males (Laduma, Ratel, and Oryx) to use the Front Table area in direct overlap with Jasper, and so Jasper may have been trying to avoid encountering, and potential conflict, with these older males. So what does this mean for the project? Vehicle collision, thus far, has been the most frequent source of mortality that we’ve observed for caracals in this study. The loss of a radio-collared caracal helps to confirm this finding. Only by radio-collaring these elusive wild cats do we have the ability to investigate the frequency of death due to other causes because often wild animals die in areas unseen by humans (i.e., in the bush). So by radio-collaring the caracals, we are interested in other potential sources of mortality that we may be able to document if they die deep in the bush, but so far, we have primarily documented death due to vehicle collision. The study is yet in its early stages, but given the degree of habitat fragmentation, the major roads that fragment Table Mountain National Park, and the isolation of Table Mountain National Park by extensive, and dense, urbanisation, our findings thus far are not surprising. To persist in Table Mountain National Park, caracals must cross roads to find sufficient prey and potential mates, and so in this need, they are especially vulnerable to vehicle collision. I mentioned some positives that come from Jasper’s death. One positive is the data that we collected. It is very interesting to us that he attempted this crossing during the day! Carnivores like caracals are known for being active at night, but we have been observing interesting daytime movement patterns in the local caracals. Most importantly, however, is that these data highlight that the implementation of wildlife corridors in rapidly urbanising cities, even beyond Cape Town, may be critical for the long-term persistence of even those species, such as caracals, that are relatively adaptable to urbanization. In documenting unfortunate deaths such as Jasper's, we contribute to the pool of evidence that wildlife corridors, particularly across major roads and through dense urban areas, are critical for wildlife conservation. But on another note…most surprising and rewarding to me was the number of people that called to report Jasper’s death! So, I want to commend the citizens that called to report the death as soon as they were able! Without the quick action, we may not have been able to recover his body. And because Jasper's radio-collar was destroyed when he was hit, we would not have known if his collar suddenly stopped functioning and Jasper was alive still, or if he was hit by a car and the collar destroyed. So, this quick action by numerous people shows that we have great community support, but also that the community thinks that the work we are doing is worthwhile. We are also getting the word out sufficiently that we are establishing ourselves as a resource for people to call and report these incidents, which means getting the community involved in a way that increases our productivity and ability to collect important data relevant to conservation. This support helps fuel the project for me, because the project presents significant daily struggles. I am struggling greatly to find funding to buy a sufficient number of radio-collars, I still have not found stable, financially viable, accommodations for our interns who are paying their own way(! ), we need another bakkie for the interns to drive (we are looking for a used one! ), and now with Jasper’s death, we are actually “down” a radio-collar (and therefore R30,000) because it was destroyed by the car that hit Jasper. However, with increased recognition of our work, hopefully we will become more competitive in our grant-writing efforts, but also find community members able to provide some financial support for the project. If you are one of those community members, please visit our 'Support' page. Any amount helps!